Within my culinary circles you don't hear much about Bolivian cuisine. 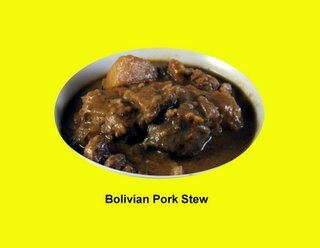 Of the few distinctively Bolivian recipes I've encountered, the stew pictured at right, inspired by a recipe in an international cookbook that's long out of print, has proven to be the most satisfiying---far more so than the photo suggests. The mix of 18 ingredients is unique and produces a flavor profile that should please almost any palate. If you coax your butcher into carving the pork into 1/2 inch cubes, all the better. It took me an hour to cut up a 4 1/2 pound pork shoulder to render 3 pounds of reasonably lean cubes. Heat the olive oil in a large saucepan. Add the onions and garlic and saute for 5 minutes, stirring frequently. Add the rice and meat and cook over high heat until the meat is brown. Add the tomatoes, saffron, salt, pepper, chili peppers, clove, cinnamon, and broth. Cover and cook over low heat for 30 minutes. Add the potatoes and bananas and cook 15 minutes longer. Add the peanuts, cream, and molasses. Cook for 15 minutes, or until the meat and potatoes are tender. Correct seasoning and serve hot. referred to as "saffron" and labeled as such.